Stop time, return to Prague under Rudolph, and succumb to the magic of legend – in the culinary and spiritual art of the Alchymist restaurant on Prague’s Malá Strana. Medieval chemistry, or alchemy, occupied itself with the discovery of the “Philosopher’s Stone” and the “Elixir of Life”, through which ordinary metals could be converted to gold and an elixir for prolonging life would be discovered. Even the eccentric Czech ruler Rudolph II openly supported astrologers, astronomers, and alchemists, believing that they weren’t quacks, but were rather pursuing an existentially important philosophy. The philosophy of Alchymist, which opened in October 2003 in Nosticův palác, is based on this conviction. This Lesser Bank palace was originally called U vinařů after a famed wine merchant who lived in the Komenský era and actually sold wine there. 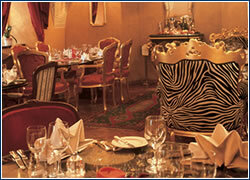 The restaurant is now a part of the residence, but its door is open to everyone. Alchymist is a popular place for meetings, mainly among Italians and French people living in Prague, but more and more Czechs also visit. This is partially due to the club-like layout, dominated by comfortable antique furniture with soft cushions and broad tables offering guests plenty of room. Upon entering you’re dazzled by the bright colors and striking patterns of the interior, revealing the creator’s temperamental southern European background. 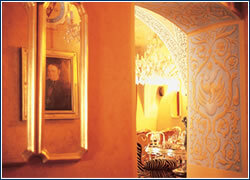 Italian Giorgio Bonelli owns the establishment and also designed the interior. Bonelli conceived his first and as yet only Prague restaurant as a whole, made up of several rooms symbolizing individual stages of alchemy. Materia Prima is the basis, which becomes the Philosopher’s Stone through alchemy. Alchemy involves working with four elements – fire, water, air, and earth – and spirit. The alchemical process takes place on two levels: spiritual and material. The spiritual level is the restaurant’s interior, with its remarkable Moroccan salon with Oriental elements, or the Room for the Wise, with a Wisdom fresco on its ceiling. Three painters – Nikša and Anna and Drena Čvorović – and the sculptor Karel Kronych saw to the details of this elaborate interior. The Alchymist’s culinary art is seen as the material level, as his figure guards the door to the kitchen, an imaginary alchemy lab. In its own way, cooking is the oldest form of alchemy, and chef Tomáš Sysel’s team converts all ingredients into refined culinary creations. 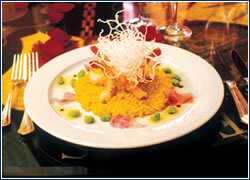 A rich menu results, with four courses including primarily Italian specialties and several famous French dishes. Veronika Chotěborská, the restaurant’s manager, recommends warm Caprini sheep cheese for a starter, with black truffles, mache salad, and Port wine syrup. Main dishes include specialties like grilled lamb chops with potatoes, mushroom mousse, and garlic confit, or beef fillet tagliata with marinated red peppers, rucola, and Parmesan cheese. Pasta fans will love the Bergamo casoncelli with butter, chives, and bacon sauce, or Milanese saffron risotto. The somewhat unusual cre`me brulée – pistaccio – is further evidence that at Alchymist guests have equally spiritual and culinary experiences. The wine list is predominated by Italian wines and offers somewhat fewer Czech and French varieties. Recommended are the Italian white Fiano di Avellino Radici from Campania and many reds: Chianti Classico and Gallo Nerro from Bartalli, Chianti Classico Riserva from Castello Banfi, Cannonau di Sardegna from Sardinia, and Brunello di Montalcino from Tuscany. As in alchemy, where the ingredients go through gradual transformations, you’ll feel like a new person after your visit, whether you come as a philosopher or an eager-to-learn guest. Asian shrimp salad and pesto rucola vie for attention with a real pastrami sandwich in an inspired food shop which opened last month in a quiet square off Národní. 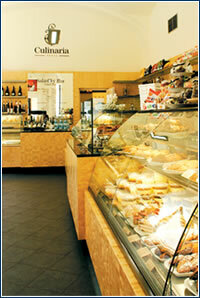 Culinaria offers a selection of gourmet and classic consumables which can rekindle fond memories of foods found while travelling, or simply teach you more about what you eat. “Whatever we sell here has a reason for being here – it’s hand-picked,” says owner Silvia Havelka. An herbal juice bar and pleasant setting make a short stay worthwhile. If you fancy horses and the romanticism of the Wild West, then Ranč Kostelany is a perfect tip for a summer weekend. 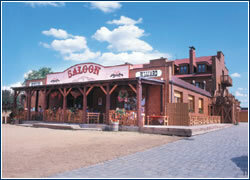 You will find here a copy of a Western town, a pension and a real “saloon-style” restaurant. The kitchen offers various international dishes, and if you can be on time for the lunch menu (between 11-14:00), you’ll pay only CZK 60. The garden is a must, as are specialities on the lava grill. In addition to preparing food, from May to September the operators organize Western shows. Visitors can go for a horse ride (CZK 290) any time of year, or have a lesson in western riding (CZK 380). The natural surroundings with forests offer many possibilities for pleasant walks or biking. How to get there: From D1 highway exit Vyškov, then head in the direction of Kroměříž and Zdounky. After 4 km in Jarohněvice, turn left to Kostelany.